These procedures treat pain caused by spine and pelvis fractures. When a fracture occurs in the spine, the bone compresses and can become very painful. The compression can involve one or more vertebrae. 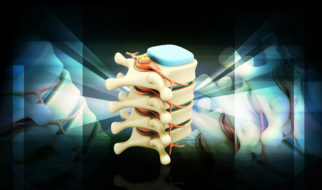 Using imaging techniques for guidance, a plastic mixture (often referred to as cement) is injected into the fractured space in the vertebrae. A small balloon is inserted into the fracture to create space for the cement. Once the space is filled, the balloon is removed. The cement mixture is inserted into the sacrum to alleviate low back and buttock pain caused by sacral insufficiency fractures. More conservative treatments, like a brace and bed rest, didn’t help. You have poor healing after a fracture. You have compression caused by a malignant tumor. Usually, you will have imaging tests done to see if you are a candidate for the procedure. You will need to avoid aspirin and ibuprofen type medications and blood thinners before the procedure. Blood will be drawn to make sure it is clotting correctly. Arrange for someone to drive you home afterward. This procedure is usually outpatient though some may need to be admitted overnight. You will lay face-down for the procedure. Your vitals will be monitored throughout. An IV sedative will be given to relax you. Other medicines may be given for nausea, pain, and to eliminate infections.